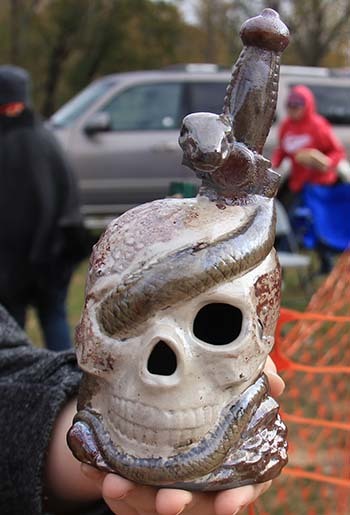 The final Art Pickens - Artist Gathering for 2017 featured Raku Firing on site, along with other artist demonstrating their methods and showing off artwork. The interactive monthly event is held on the second Saturday of the month from May through November on the green space off Main Street in Jasper, Georgia. 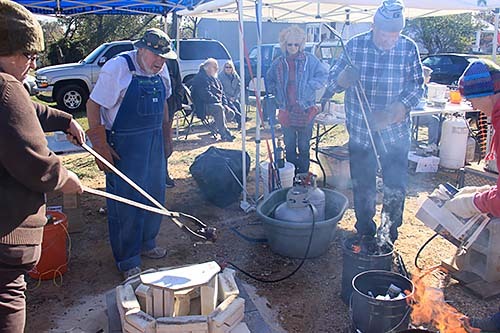 The Georgia Clay Council partnered with Art Pickens to demonstrate Raku Firing, where pottery is removed from kiln at bright red heat and placed into containers with combustible materials. Patrons were able to choose from many different pottery pieces to paint for the process. Finished products shown in the photo slideshow and Raku Firing video below. Other artist attending included Billy McCalister demonstrating wood turning, Pat Jewell making jewelry, and Billy Roper discussing techniques of his marble house totems. The events are hosted by Art Pickens and Pickens Arts and Cultural Alliance (PACA). Mark your calendars for the next one on May 12, 2018. Exciting news announced during the event that a group working with PACA is forming Southern Appalachian Folk School in Jasper. To start, the school will offer weekend classes in painting, drawing, quilting, marble carving, pottery, glasswork, basket weaving, Appalachian language and more. Video below demonstrating raku firing.